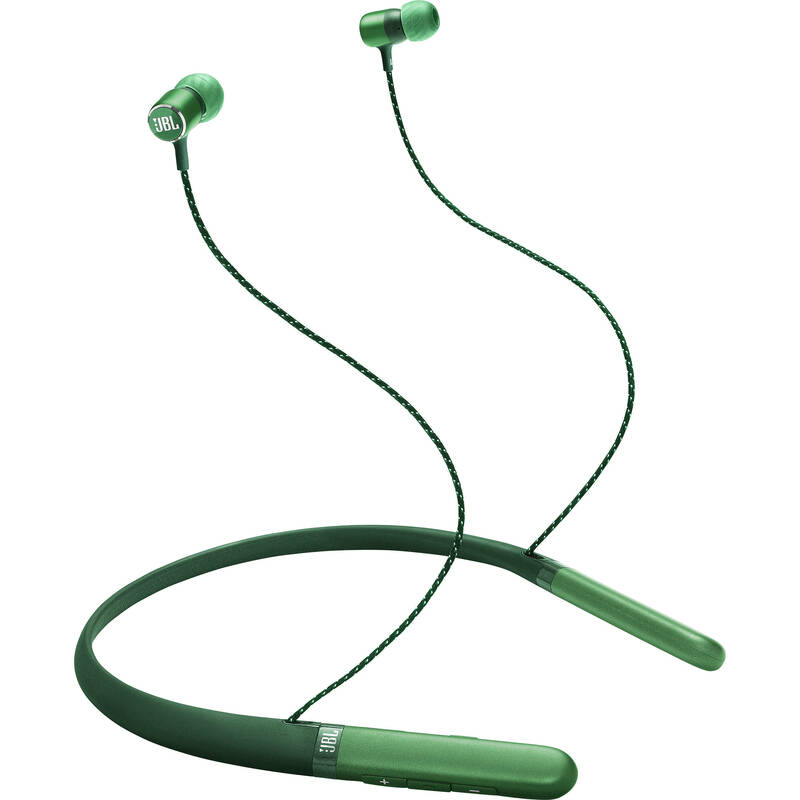 Styled in green, the JBL Live 200BT In-Ear Headphones provide wireless streaming over Bluetooth from compatible devices. The earbuds sport 8mm dynamic drivers with a 20 Hz to 20 kHz frequency response that delivers punchy bass. Furthermore, these aluminum earbuds are magnetic, aiding in the fight against cable tangling when you're not using the in-ear headphones. Eartips are provided in various sizes, as is a charging cable. A flexible neckband provides comfort throughout your listening experience, as well as a remote for the earbuds. You'll also note the microphone for taking calls, with which you can also dictate commands to your digital voice assistant, be it Siri, Google, or whatever personality is invented for us in the future. Multi-point connection allows for seamless switching between various devices, or between music and phone calls. The battery lasts for ten hours and can fully recharge in two hours. Box Dimensions (LxWxH) 8.9 x 7.3 x 1.7"
Live 200BT In-Ear Neckband Wireless Headphones (Green) is rated 4.2 out of 5 by 39. Rated 4 out of 5 by Beck75 from Fine Product Volume capability could be greater. Other than that it is a fine product. Rated 4 out of 5 by drutley12 from Good Soud Quality But Bad Design I've had my JBL Live 200BT earbuds for about a month now and I love the sound quality. It gives me the sound that I was looking for. However, the design of the "around the neck holder" was bad! My earbud holders do not stay around my neck. They always slip off and fall to one side. I'm afraid that I will lose them soon because of this problem! If JBL could perfect this design flaw they would get a perfect 5 stars from me!